Lawyers for the Trump administration appeared once again in a courtroom in San Diego to ask a federal judge to push back his deadline for the reunification of children under five years old who were taken from their parents at the U.S.-Mexico border. And once again, U.S. District Judge Dana Sabraw held off on giving them an extension, and demanded instead that they return to court on Tuesday to explain how many families were reunited, why the government failed to reunite the rest by the deadline, and how much more time it will need for those cases. Justice Department attorney Sarah Fabien said that while only two children out of the 102 the government has identified have been reunited so far, she believes another 54 can be returned to their parents by Tuesday’s deadline. As for the rest, she claimed, three were brought to the U.S. by someone who is not their biological parent, three have parents with serious criminal records that bar reunification, five have parents with something on their record that requires further investigation, 12 have parents either in local or federal criminal detention who must serve time before being transferred to ICE, 18 have parents who were lost by the administration after their deportation or release into the U.S., and four have been approved for release to a non-parent sponsor. At the Monday morning hearing, which reporters could listen to by phone, Judge Sabraw asked attorney Lee Gelernt of the American Civil Liberties Union, who is representing the thousands of separated families, if he believes the Trump administration is doing everything it can to comply with the June 26 court order demanding swift reunification. “I believe they can reunite some individuals tomorrow, but a major obstacle is their insistence on using the long verification process that was designed for unaccompanied minors,” he said, citing the controversial DNA testing and criminal background checks that the government is putting parents through prior to returning the young children. As the ACLU argued in Friday’s court hearing, those steps were originally designed for vetting a non-parent sponsor taking custody of a child who immigrated to the U.S. alone, not for reuniting children with their own parents. Additionally, Gelernt took issue with the Trump administration’s claim that it has lost track both of parents who have been released by ICE within the U.S. pending their immigration or asylum hearings and at least nine parents who it deported without their children. “We don’t know how much effort the government has made to find these parents,” he said. The ACLU reiterated its offer to help the administration track down both sets of parents. It said Monday that it plans to demand that the court set a deadline for reunifying parents with their kids within 48 hours of making contact if the parents are within the U.S. and within one week if the parents have already been deported. The ACLU also contested the government’s assertion that only nine parents have been deported while their children remain in custody, saying they believe the number is 12. Puzzlingly, the administration had claimed on Friday that as many as 19 parents were deported, and argued that because they have been unable to make contact with them, they should not have to reunite them with their children under the court’s injunction. Sabraw rejected that argument and reaffirmed that the deported parents, however many they may be, are part of the class action. 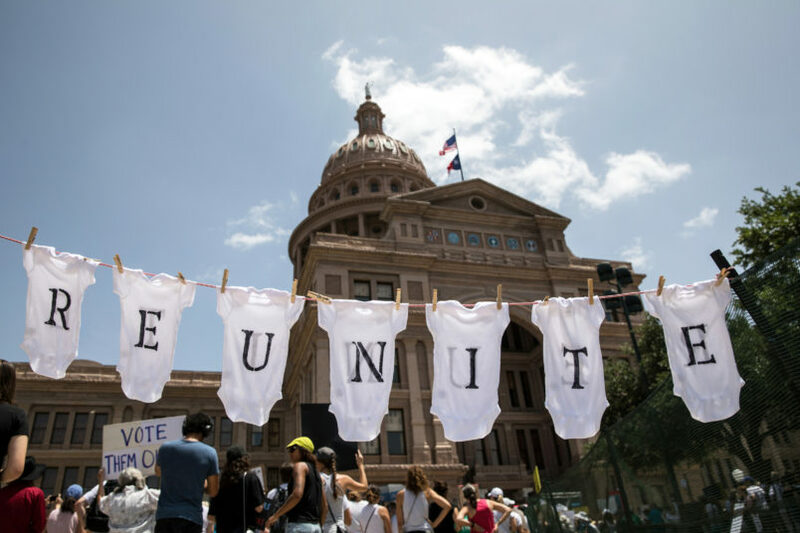 In preparation for the reunions, many detained parents have been transferred to ICE facilities closer to the HHS facilities where their children have been held post-separation. But the government has worked to keep the locations of these facilities secret under a federal protective order, citing without evidence concerns about “smugglers and traffickers” targeting the children. Because ICE has not yet built detention centers suitable to hold young children, Fabian told the court on Monday, the reunited families will be set free on supervised released while they pursue their asylum claims. As the ACLU and the Trump administration work together over the course of Monday and Tuesday to locate and reunite as many families as possible before the court’s original Tuesday deadline, Gelernt demanded permission from the court to allow immigrant advocates and faith-based groups to know the location of these reunions. “It’s extremely disappointing the government will not be in full compliance with the court order, but the judge has stepped in to manage this mess of the administration’s making,” he said.